BBC Weather's Darren Bett has the forecast for the next few days. Snow. The one thing guaranteed to wreak havoc across the UK. The Met Office says it could be the coldest week of the winter, with temperatures expected to dip as low as -15C by midweek in areas where snow has fallen. Hundreds of trains have been cancelled, schools are shut and rural communities cut off by a cold snap nicknamed "the Beast from the East". But the weather has also put pay to plenty of the week's sport. Almost a whole round of non-league games were wiped out in England on Tuesday, while six games in the Scottish leagues were also called off. The postponements struck as high as League One, with a frozen pitch at Bristol Rovers leading to their game against Wigan being abandoned. 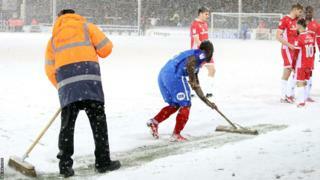 Peterborough players Steven Taylor and Junior Morias even grabbed brooms to help clear the lines as heavy snow fell during Posh's 2-1 win over Walsall. And the icy blasts come as talks to introduce a winter break continue between the Football Association, English Football League and Premier League. But what if you live in a country where it snows for more than half of the year? Deep in the Norwegian fjords, the game must go on. IL Hodd compete in the country's third tier, and reside in the small town of Ulsteinvik - described on a Norwegian tourist website as having been "moulded by ocean and ice". It gets so cold, even the artificial pitches freeze over. Hodd's player development officer Tommy Malins says Norwegian sides are kitted out to deal with the harsh weather, and that English clubs could learn a thing or two. "There is the cold you get in England, and then there are these temperatures that hurt - a sharp cold," Malins, who arrived in Norway five years ago as player-coach at Volda, before moving to Hodd, told BBC Sport. "Even the smaller clubs are now equipped with top-quality artificial pitches and tractors to clear the snow. Many have full-time workers or volunteers around on a daily basis to sweep the pitches." In the past decade, Malins says the majority of clubs in the Norwegian leagues have invested in artificial pitches with underground heating, as well as heated indoor halls - some with full-size pitches. The 30-year-old, from Hertfordshire, believes clubs in Norway's lower divisions invest more financially in their facilities than those of a similar stature in England's semi-professional set-up, whose focus is their playing squad. "English clubs could make more income with artificial pitches, you can't keep the grass in good condition," he said. "Norwegian clubs put a lot of money into having these facilities for all their teams. We have five sessions a week on the heated pitch with each side from aged eight up to the first team. "It is a great opportunity for the young players. I took a side to Molde, whose first team are managed by Ole Gunnar Solskjaer, and they got to play in a big stadium on the first-team pitch." But sometimes, the temperature drops so low or the snow fall is so much that the players have to lend a helping hand. "In January, during pre-season, they didn't turn on the undersoil heating because of costs, but by February it was like an ice rink," said Malins. "Even the artificial pitches freeze at -8C. "At Volda, we couldn't always clear the whole pitch when it snowed. It was adapt and improvise, we all got shovels and cleared a space to train in." Malins' advice for anyone due to attend a training session in the freezing weather over the next couple of days then? "Don't turn up in shorts!" he said. "We have kids outside in -4C. They come well dressed, and we keep them active." It is not just Norwegians or those in the UK that have had to battle it out with the recent snowy conditions. The cold spell is carrying freezing winds across the continent, and temperatures as low as -30C. Juventus' Serie A match against Atalanta on Sunday was called off, while there were flurries of snow in Barcelona during Formula 1 testing on Tuesday.